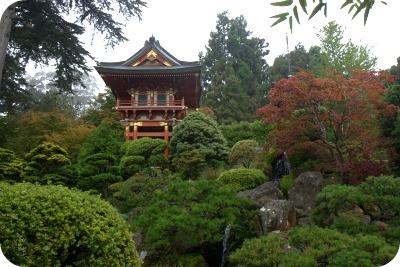 A 5-acre oasis, the Japanese Tea Garden in San Francisco is a soothing spot to spend an afternoon. Read this page of the San Francisco Travel (Secrets!) Guide for information, photos and tips on how to see it. *Entrance is free if you enter the garden before 10 am on Mondays, Wednesdays and Fridays! Best time to go: The garden is lovely at anytime, but it's at its prettiest during the months of March and April when the cherry trees and azaleas are blooming. 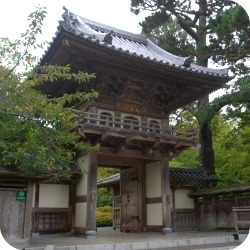 When not to go: Again, there isn't really a terrible time to go, but any tourist attraction (and the Japanese Tea Garden is definitely that), will be significantly more crowded during the summer months and on weekends. If you like to avoid crowds like I do, go on a weekday and try to get there early in the day. 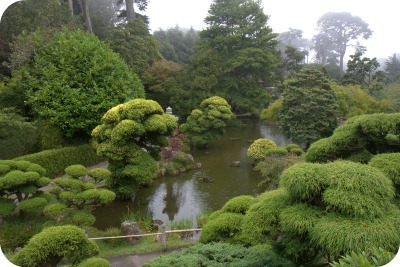 Weather: The Japanese Tea Garden is located in the Sunset district which is frequently foggy, especially during the summer months of June, July and August. Read about weather in San Francisco to prepare yourself and have a better understanding of our seasons. Free guided tours! 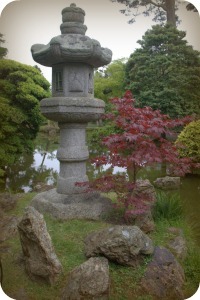 City Guides offers free 45-minute walking tours of the Japanese Tea Garden several times a week. If you go on a weekend, you just have to cover the cost of entrance. There are also tours during the week meet before 10am, and therefore don't have an admission fee. Japanese gardens are considered a high art form, and a lot of attention goes into the proper placement of every stone, river, tree, shrub and sculpture to achieve a balanced harmony, that aims to mimic natural landscapes. 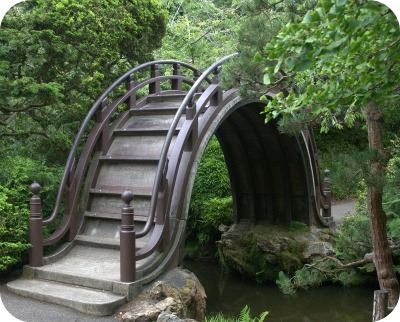 The Japanese Tea Garden of San Francisco is specifically a "strolling" garden, which utilizes a "hide and reveal" principle that allows you to discover new things as you weave your way through it. Climb over the steep Drum Bridge, also known as a Half Moon Bridge, which has been a part of this Japanese Tea Garden since it first opened. One, it reveals a reflection of a full circle or full moon over still water. Two, the steepness forces those entering a tea garden to slow down, allegedly putting them in the right state of mind for a tea ceremony. Three - and perhaps the most practical - it allows for boats to pass underneath, while using minimal amount of space on the plots of land that support it. Walk the pathways and observe different species of native Japanese fauna. Meditate on the dry Zen Garden - a rock waterfall and stone river - designed in 1953 by Nagao Sakurai. 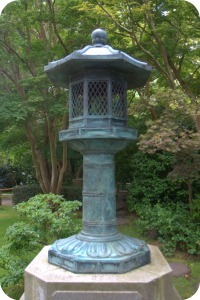 Reflect on the 9000-pound, bronze Lantern of Peace. It was a contribution paid for by Japanese students and brought over as a gift to stand as a symbol of friendship between the US and Japan after World War II. Notice the Buddha statue and its gestures. 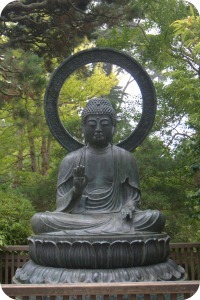 Its raised and open palms are symbols of protection and peaceful intentions. It was gifted to the garden in 1949, but originally cast in 1790. It's more than 220 years old! Count the tiers of the Pagoda. Each one represents one of the 5 natural elements within the Japanese philosophy, godai. It begins with earth at the base, then follows with fire, wind, water and sky or heaven at the top. 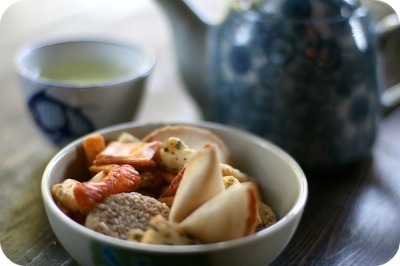 Enjoy some afternoon tea and traditional Japanese snacks at the rustic, but charming, outdoor Tea House. The claim states, perhaps surprisingly, that this is the first place to bring fortune cookies to the US! Before you leave the gardens, look closely at the front entrance gate. It is no longer the original, but a recently rebuilt version of it. It was designed and built in Japan, then taken apart, imported, and put together again. Except for the roof, it's put together entirely without nails. Such is the excellence of Japanese carpentry! 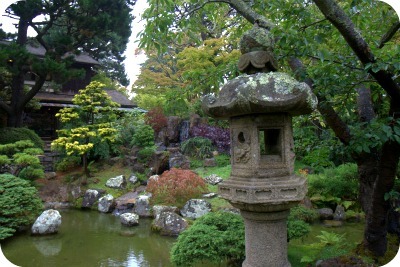 The Japanese Tea Garden of San Francisco is the oldest, public, Japanese garden in the United States. It was first created as a temporary exhibit meant to resemble a Japanese Village, in 1894, for the World Fair's Midwinter International Exposition. 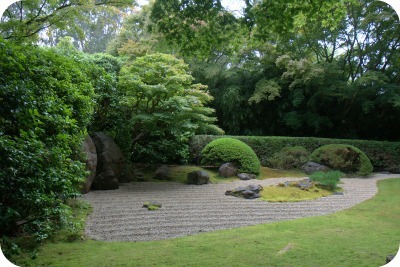 A wealthy Japanese baron and landscaper by the name of Makoto Hagiwara funded and built the exhibit, and when the fair was over, he convinced John McLaren (superintendent of Golden Gate Park at the time), to turn the garden into a permanent attraction. Makoto Hagiwara went through great efforts to create an authentic tea garden. He imported flora and fauna local to Japan (such as special trees, fish and rare birds), as well as valuable statues, ornaments and sculptures to enhance the setting. Hagiwara and his descendants cared for the garden until 1942, when, during World War II and following the Japanese bombing of Pearl Harbor, they were ordered to leave San Francisco and relocated to internment camps. The park was renamed the Oriental Tea Garden to disassociate it from its Japanese affiliation. 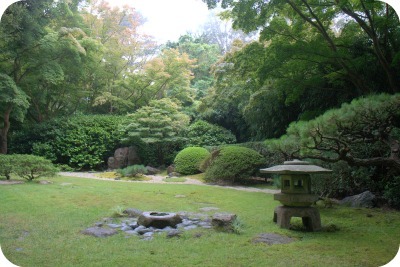 The city took over management of the gardens, but without the careful attention to detail that the Hagiwara family applied to the area, it fell into a deteriorated state. Additionally, many of the garden's sculptures and structures were stolen or destroyed by vandalism. Even though it had been promised to them, when the war was over the Hagiwaras were not permitted to resume management of the garden. Although it is a lovely garden, rumor says that it does not resemble the place that it used to be. The original name was brought back in 1952, and in 1974, a bronze plaque was placed in the garden to honor the family and their work. The tea house is the main reason that my family, friends and I go to the Japanese Tea Garden. The menu has a variety of traditional Japanese snacks, both savory and sweet, as well as hot and cold beverages. My 9-year-old nephew especially likes an imported Japanese soda that they sell there, which comes in a unique glass bottle. The food is not amazing; there are better places in San Francisco to have sushi or traditional Japanese food, or even other San Francisco tea houses to visit, but it's the setting that makes it special. Japanese tea gardens are designed specifically to be places that invite contemplation, and if you can go at the right time, it's a wonderful place to slow down and unwind over a warm cup of green tea. 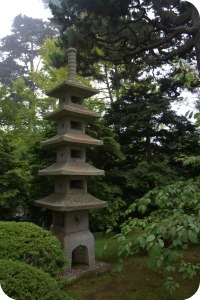 The Japanese Tea Garden is located at 75 Hagiwara Tea Garden Drive close to the center of Golden Gate Park. It's conveniently close to both the California Academy of Science and De Young museums, as well as the Botanical Gardens. To get there from outside the park, enter at either 8th Avenue from the north side, or 9th Avenue from the south. Check out the google map below. 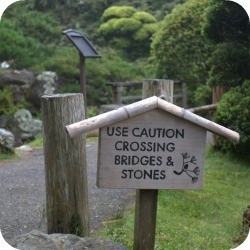 There are 3 main bus lines and one train line that will get you close to the Japanese Tea Garden, San Francisco. Click here for a handy tool to help you plan your bus or train route. The best way to navigate around the city is to stick to the roads that are part of the "green wave" network. These streets help to keep traffic flowing by operating on timed lights, so that you rarely have to stop. left on 8th Avenue into Golden Gate Park for street parking, or left on 10th Avenue to park in the garage. Fell Street (one-way) --> which will turn into Kezar Drive --> which will turn into Lincoln Way --> make a right onto 9th Avenue into Golden Gate Park. Look for street parking. There are two options - street parking and a parking garage. The parking garage is located below the DeYoung Museum which you can enter at 10th Avenue and Fulton, on the north side of the park. They are open from 7:30am - 10pm, and charge reasonable hourly rates. Street parking can be tough, but it's do-able. I rarely use the parking garage. Look on the streets inside of Golden Gate Park first. There are often spaces along Stow Lake Drive. *Martin Luther King Drive is closed to vehicles on Sundays.